Deer jerky is the favorite type of jerky for people who like their meat salty, sweet and with a hint of toughness, too. There can be nothing better than making deer jerky in your own dehydrator and knowing that everything you’ve used in the recipe is free of any chemicals or any contaminating agents. When you make jerky in your dehydrator, you can control every step of the process and also use your own recipes for making deer jerky. 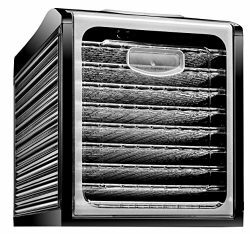 Most of all, you can dry as much or as little as you like when you have a dehydrator in your house. If you’re looking into buying a dehydrator for making deer jerky there is a wide range of dehydrators that you can choose from. But with so many models of dehydrators available in the market it can be really tough to make a choice. In this article, we have reviewed ten dehydrators that have the best set of features most ideal for making deer jerky. You can read through this article to get an in-depth view of the features of the dehydrators and choose the unit that best suits your budget and requirements. If you are buying a dehydrator for the primary purpose of making deer jerky here are some of the features that you should look for before making the final purchase. If you’re going to make deer jerky in your dehydrator, you need a unit with ample space for keeping the pieces of venison. While the pieces shrink in size as water and moisture is dried out of them, initially you should place them on the trays in such a manner that the pieces do not overlap. This allows for air to pass more efficiently through the trays and quicker dehydration. Meat, while being dried needs to be cooked at varying temperatures so that it’s dried from the inside out and all the bacteria and pathogens are also killed. That’s why you should look for a dehydrator with a thermostat so that you can dry the venison properly and safely too. When you are drying venison you have to make sure that you do not make it too dry and brittle. An inbuilt timer feature can be really helpful to avoid over-drying the meat. You can set up the timer as per your requirements and the dehydrator will shut off once the timer is over. Cleaning the dehydrator trays can be a troublesome task. Often, juices and oils from the meat get stuck to the dehydrator trays and the plastic is difficult to wash with regular washing supplies. Having trays that are dishwasher safe can help you in saving time and bother of washing the trays by hand. 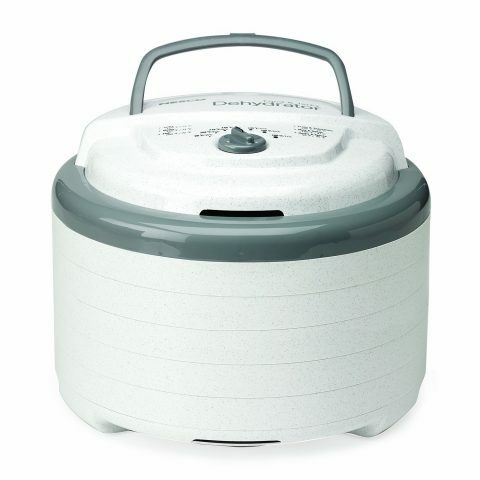 Excalibur is one of the most well known brands that make dehydrators. 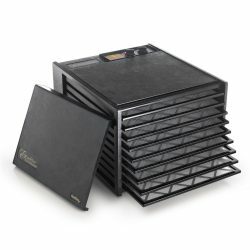 The Excalibur 3926TB Food Dehydrator comes with 9 trays that offer ample drying space for all kinds of meat. If you’re thinking of drying deer meat for jerky then this is one of the best dehydrators in the market. The unit also comes with a flexible poly-screen tray insert that prevents food from sticking to the trays. With 600 watts of power and a 7 inch fan, this is the ideal dehydrator for making large amounts of jerky. The Presto 06301 Dehydro Electric Dehydrator offers excellent drying ability for all kinds of foods and it is also great for drying deer meat. The unit comes with sample packets of jerky spice and cure that you can use for making deer jerky. Precise temperature is important when making jerky and with the dehydrator’s temperature control and timer, you can achieve just that. With ample temperature range of 90 to 165 degree F, you can rest assured that the meat you dry will be safe from all kinds of contaminants. 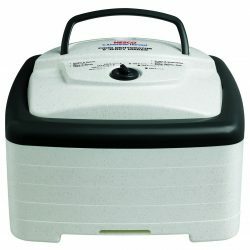 The Nesco FD-75A Snackmaster Dehydrator offers 600 watts of drying power and five trays that can be expanded up to 12 trays. The unit also comes with opaque vita-save exterior that blocks the rays of light that destroy the nutritional value of food. The dehydrator is small in size and it looks good on any kitchen shelf. You can dry any amount of meat in it for making jerky and if you’ve more requirement, you can get more trays. The Nesco FD-61WHC Snackmaster Express Dehydrator is an excellent unit that offers efficient drying and quick drying times for all kinds of deer meat jerky recipes. 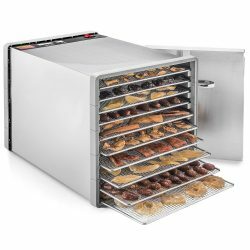 You can place the meat in the trays of this dehydrator and the unit will dry the food quickly with 500 watts of drying power. 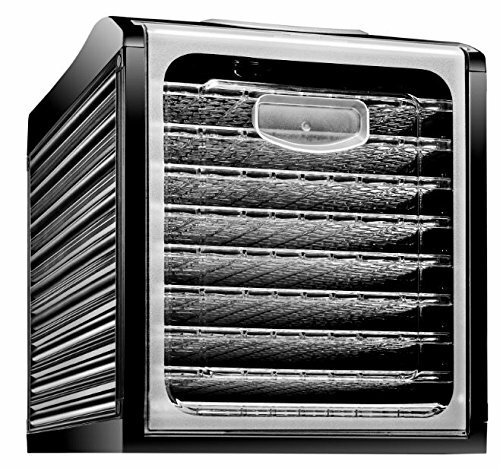 The patented drying system forces the hot air through the center of the unit and across the trays for an even drying. The Gourmia GFD1550 is a space saving dehydrator unit that comes with five trays that offer ample space for drying deer meat. The unit comes with five trays that are BPA free which means these are safe to be in contact with food. You can set up the time and temperature as per your liking in this dehydrator unit. You can set up a timer for as long as 36 hours for lengthy drying sessions. The STX International Stainless Steel Dehydrator is an excellent unit for drying large quantities of deer meat. 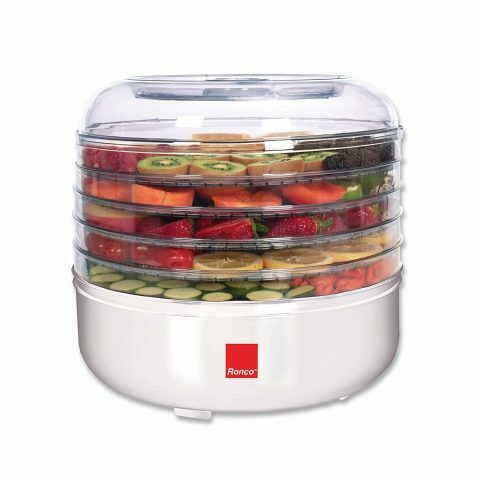 This dehydrator has an all steel construction with stainless steel fine mesh trays that are also dishwasher safe. The unit has a rear-mounted fan that offers efficient drying for all kinds of foods. You can also set up the timer and temperature as needed for drying meat as per your taste. In all, this dehydrator offers an extensive range of features in a highly durable package. If you’re looking for a high quality dehydrator that also offers ample capacity for drying venison then the Chefman Food Dehydrator Machine is here for you. This dehydrator comes with 9 slide-out trays that can be used for drying all kinds of meat. The unit also has digital controls that allow you to set the timer and temperature needed for drying food. 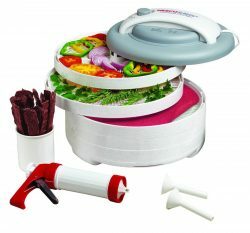 In all, this high capacity dehydrator is ideal for game hunters who have ample quantity of meat to dry. Nine spacious trays measuring 13"x12" each. The Nesco American FD-80 Dehydrator is a classy looking unit that offers a range of features that are ideal for drying deer meat and making jerky. The unit comes with a highly efficient air circulation system that offers quick drying through the trays in an even manner so that there is no need to rotate the trays. 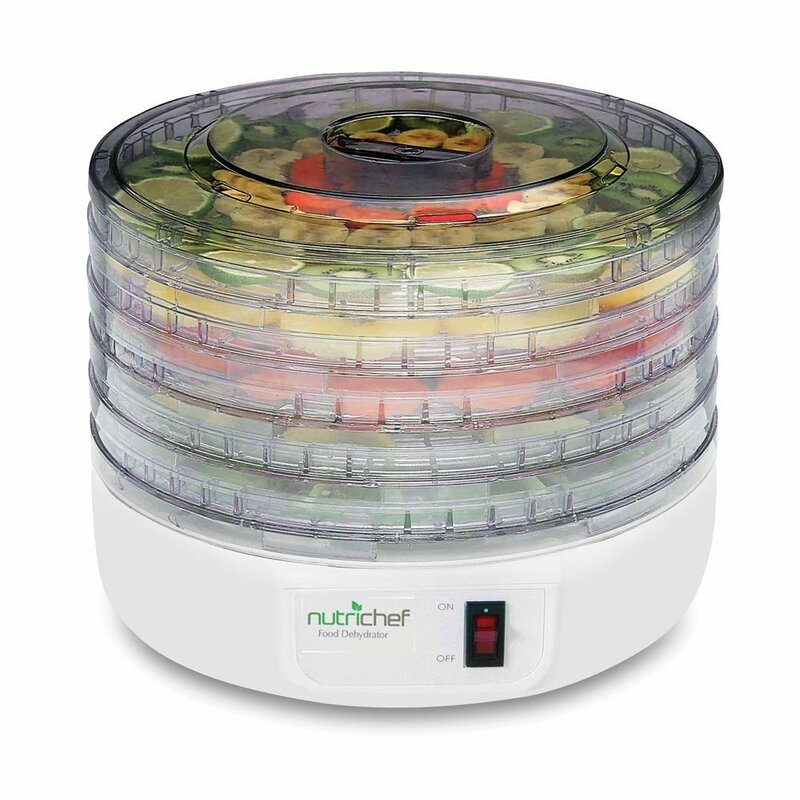 If you want to make deer meat jerky then this is a really balanced dehydrator that you can use. The Ronco 5 tray electric food dehydrator offers 125-watts of drying power and comes equipped with 5 trays that offer ample space for drying deer meat. The dehydrator is designed in a way that adds efficiency to the flow of heat through the trays and offers evenly dried food. Make sure you cook the meat to 165 degrees F to kill all the germs and bacteria before drying it in the dehydrator. The unit also comes with an instructional booklet that includes recipes for drying various kinds of foods. The NutriChef PKFD-12 Countertop dehydrator is a simple device that offers ease of use and power while drying deer meat. This unit comes with 5 removable trays and a single button operation that makes it easy to use. 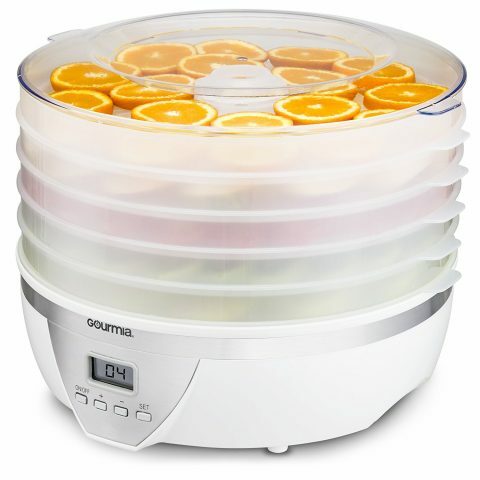 With maximum temperature going up to 180 degrees F, you can easily dry all kinds of food in this dehydrator. The trays of this dehydrator are designed for maximum heating efficiency as heat travels through the trays in a more efficient manner. Buyers often have questions or queries about buying dehydrators for drying jerky. Here are some of the frequently asked questions about best dehydrator for deer jerky. Q1) What is the safe temperature for drying meat? Ans. According to the FDA, meat should be dried at or above 165 degrees F to kill the bacteria and harmful pathogens present in the meat. You can also cook the meat in your oven at this temperature before drying it in your dehydrator. Q2) I tried drying deer meat in my dehydrator and the final result got stuck to the trays. How can I prevent this from happening? Ans. You can keep a dehydrator sheet between the meat and the trays. Also, make sure the trays are clean of all oils or moisture when you place the meat on the trays. Q3) I have a lot of venison. Do I need to pre-treat it before drying? Ans. Pre-treating deer meat is up to your own preference. 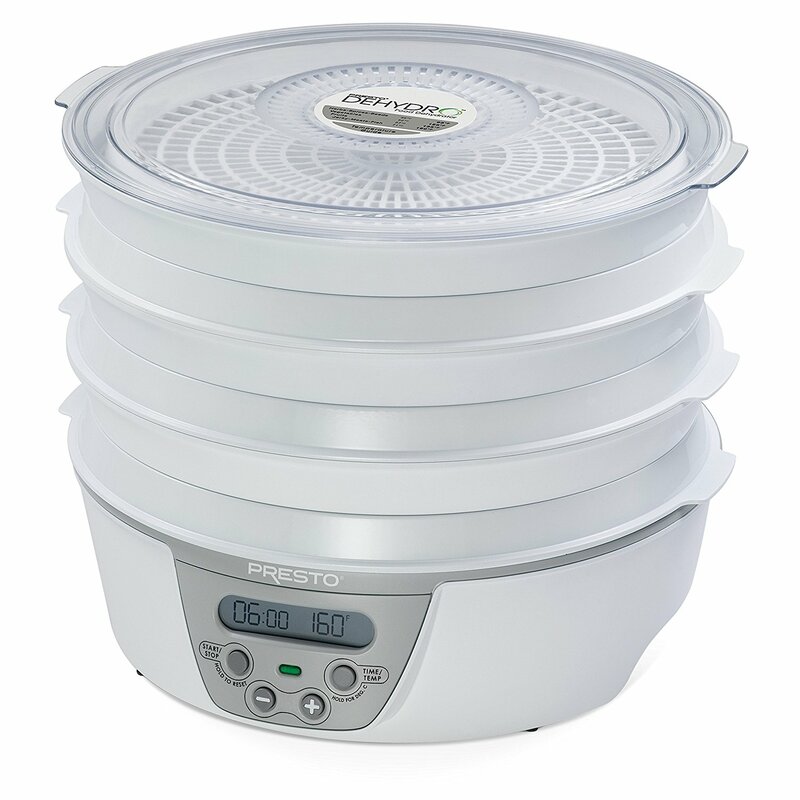 If your dehydrator has the maximum temperature less than 165 degrees F, then you should cook the meat before drying to kill off all the bacteria and pathogens. Q4) I tried drying deer meat but it came out to be too hard. How can I prevent this? Ans. If the final jerky was too hard, then you might have dried the meat for too long. You can always check the meat while it’s drying for some hours for its texture and taste by taking out a piece. Q5) I dried some deer meat last week and a lot of it is now stuck to my dehydrator trays. How can I clean it? Ans. You can soak the trays in a mixture of warm water and soap overnight and then try scrubbing it off with a brush. If that does not work, soak the trays in a solution of water and 1 part vinegar and scrub till the dried meat cleans off. Dehydrating venison for jerky in the comfort of your own home can be a great experience. You can try various recipes for drying deer meat and be at peace knowing there are no chemicals or preservatives in the jerky. By choosing a dehydrator with features that make it ideal for drying jerky you can make better jerky in less time too. Just make sure there is ample space between the pieces of meat while it’s on the dehydrator tray and you don’t dry it so much that it loses all texture. We hope this article has been helpful in letting you make up your mind about buying a dehydrator. Happy dehydrating!